Troubadour Award presented to John Prine at BMI (Broadcast Music, Inc.) Nashville office.The award celebrates songwriters who have made a lasting impact on the songwriting community. The award, given only once previously, honors writers who craft for the sake of the song and set the pace for generations of songwriters who will follow. JOHN PRINE'S Fair & Square on "The 100 Best Albums On eMusic" comes in at #96 from the subscriber poll!!! Check out the complete eMusic list here!! Pick up your copy of Fair & Square on VINYL at Oh Boy Records!!! PASTE Magazines #30 of 100 Best Living Songwriters public poll. 8/01 - In Spite of Ourselves is selected as one of Being There magazine's 25 Greatest Country Albums of All Time! Top 10 of the Top 100 Folk Artists of 2005 by radio WUMB listeners! FAIR & SQUARE IS IN AMAZON.COM'S Best of 2005 Customer Favorites - and Best of 2005 Editors' Picks in Folk AND #1 Best of 2005 Customers Picks in Folk ! Sept 20, 2004 - Proviso East High School Alumni Wall of Fame - Maywood, IL: inducted to this elite group of Proviso East Alumnus's were John Prine (1964) along with Hugh Muir, a Maywood trustee; dermatologist Sidney Barsky; Frank Peter Yomine, who died at Pearl Harbor on the USS Arizona; astronaut Eugene Cernan, the last man to walk on the moon; the late Ray Nitschke, a former Green Bay Packer and NFL Hall of Famer; Molly Cavanaugh, a 50-year District 209 employee; Queenella Miller, a professor at Northeastern Illinois University and National-Louis University; Eugene Moore, Cook County recorder of deeds; Sheila Crump Johnson, co-founder of Black Entertainment Television; dermatologist Gary Barsky; Melrose Park Mayor Ronald Serpico; Patricia Granados, president of Triton College; and basketball player Michael Finley of the Dallas Mavericks. Feb 10, 2003. "Lifetime Achievement Award for Contribution to Songwriting" from BBC Radio 2 Folk Awards in London Emotionally presented by Johnny Walker. 2/26/2000 "First Ever Really Cool Guy From Proviso East 1964" award in recognition of fabulous music that has made us proud from Proviso East High School and the Maywood Fine Arts Association. AFIM Indie Award for Short Form Video - "Ain't Hurtin' Nobody"
AFIM Indie Award for Rock Music - "Lost Dogs and Mixed Blessings"
AFIM Best Seasonal Music Indie Award for "A John Prine Christmas"
Genre: Folk /Category: Best Contemporary Folk Album including Best Ethnic or Contemporary Folk Recording 34th Annual GRAMMY Awards. 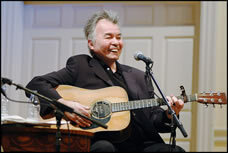 Handwritten John Prine Lyrics Auction The Americana Music Association is auctioning handwritten lyrics by many noted artists, including John Prine. 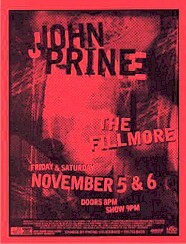 John donated his classic "Angel From Montgomery," and you can view it here. All proceeds benefit the Americana Music Association. 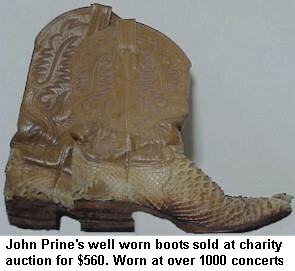 On 10/10/2000 an anonymous buyer won a pair of John Prine signed boots worn at over 1000 concerts for $560 at the ASCAP & NSAI 2000 Silent Auction!